April 11, 1994, LG Crabo. 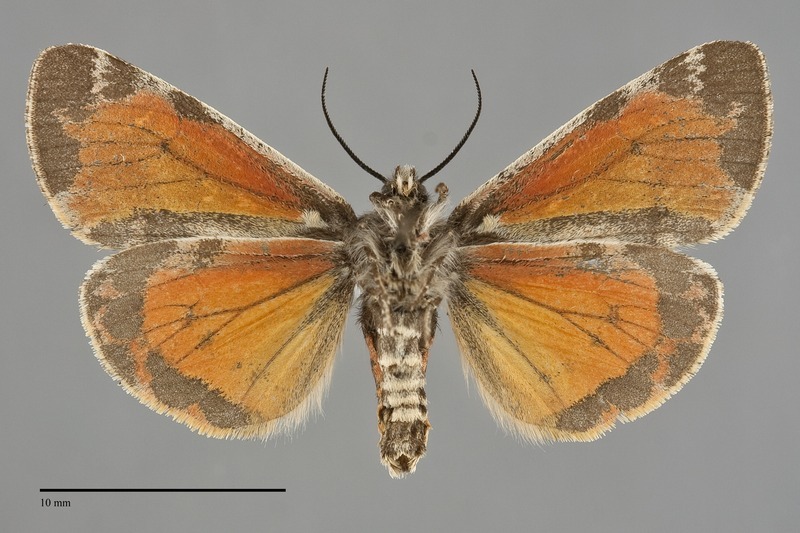 Leptarctia californiae is a colorful highly variable small to medium size (FW length 12 - 17 mm) diurnal moth found in spring. 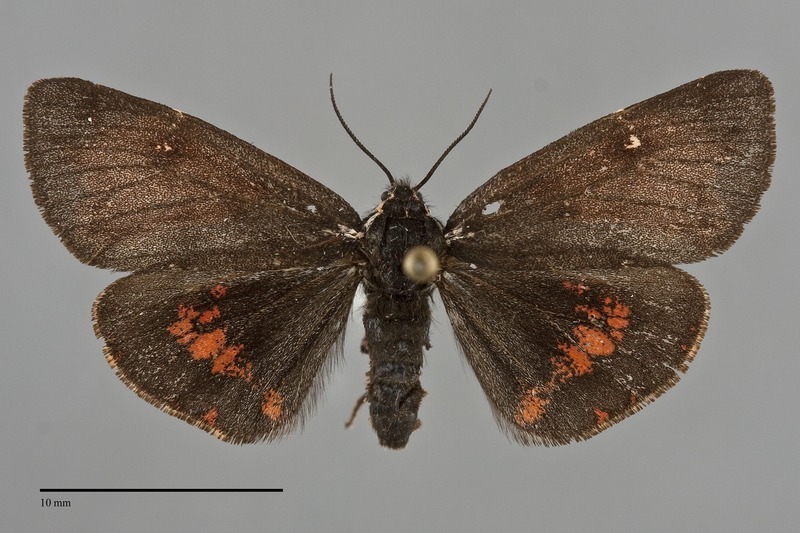 The forewing is more uniform than the hindwing, dark gray with darker gray transverse lines. Variable amounts of lighter cream patches are present, most often on the veins at the wing base, at the anterior postmedial and subterminal lines, and along the trailing margin. 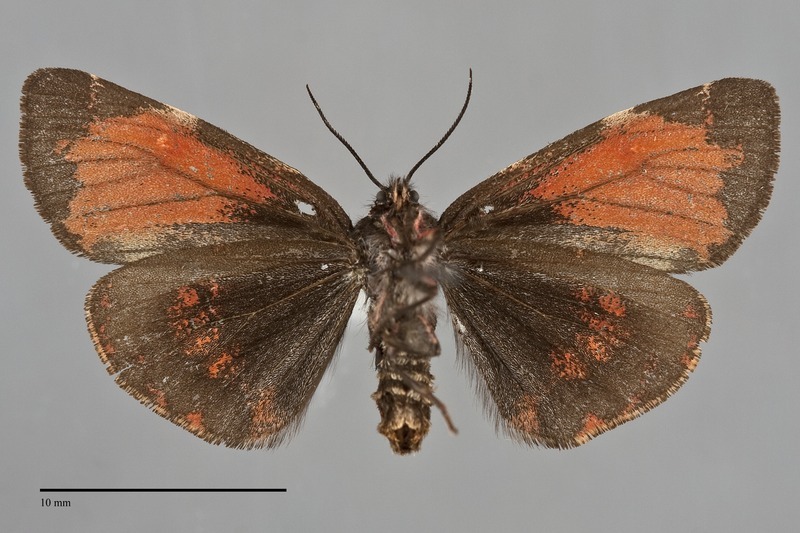 The variable hindwing is usually bright orange, but variants ranging from nearly white to deep red or entirely black occur. The wing is marked with black, most commonly at the base and as a marginal band, but there is great variation in the amount of black between the base and marginal band from none to almost complete coverage. The head, thorax, and abdomen are dark gray dorsally and slightly lighter gray ventrally. 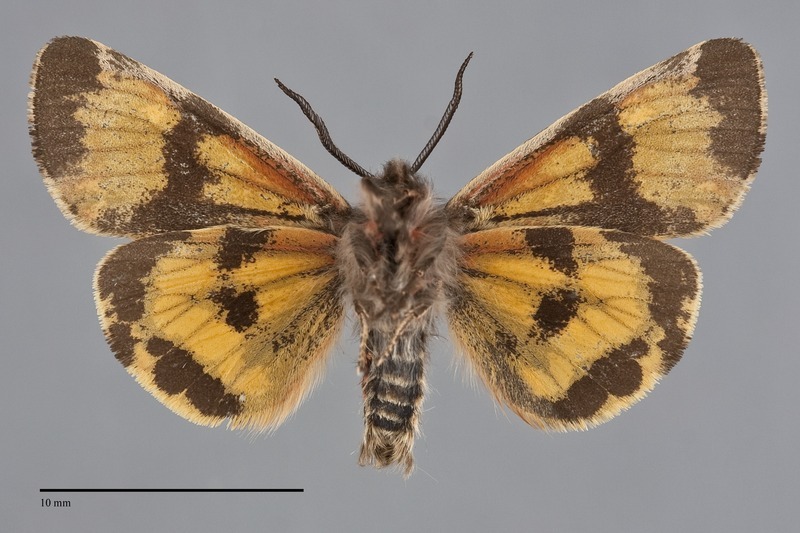 Variable amounts of cream is present on the thorax, and there is also variable amount of the hindwing ground color on the legs and lateral abdomen. 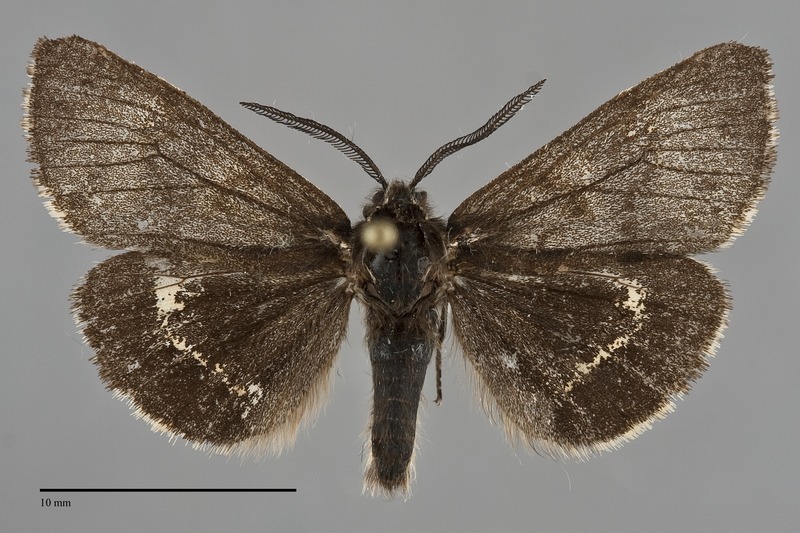 The black antennae are bipectinate, wider in males than females. 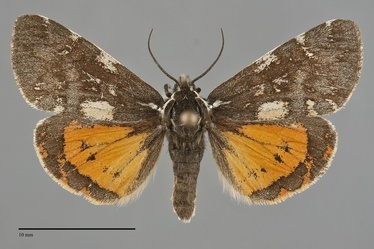 L. californiae is unlikely to be confused with most other moths. 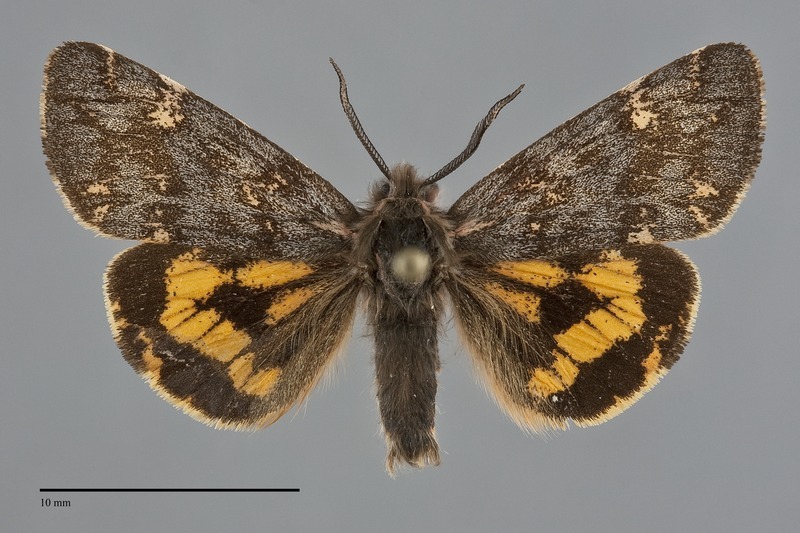 Some Drasteria species have brightly colored hindwings and fly with L. californiae in some parts of its range. The fore- and hindwing patterns are quite different in Drasteria and their antennae are simple. This species is widely distributed throughout much of western North America in sporadic and local colonies, but it can be locally abundant. In the Pacific Northwest, it is most common in open forests, meadows, and clear-cuts at middle elevations in the mountains. L. californiae is widely distributed in the Pacific Northwest south of Lillooet, British Columbia except in the most arid portions of the Columbia Basin and southern Oregon and Idaho. 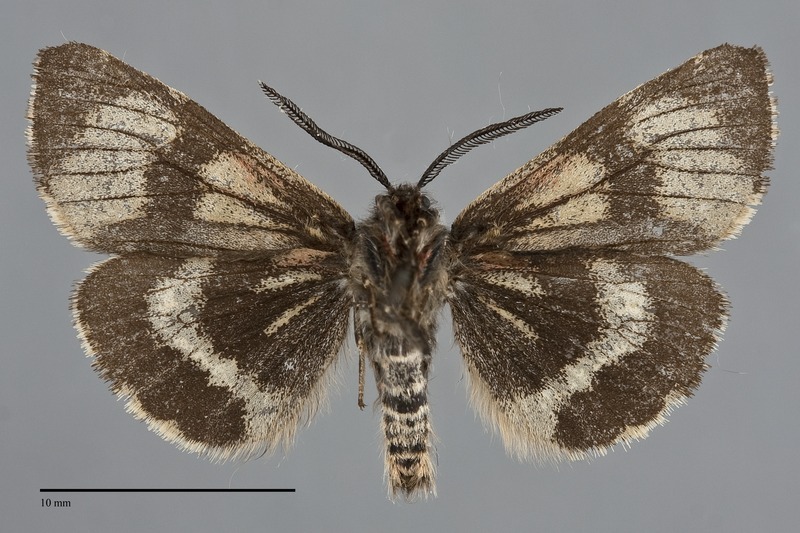 This species occurs widely in western North America south of the Pacific Northwest. This species is a generalist feeding on a variety of herbaceous vegetation. Adults of L. californiae are diurnal and are usually collected by hand netting. They are usually found in spring, occurring later in the summer at higher altitude. They do not visit flowers.